Baby’s perfect soothing companion! Perfectly sized for tiny hands to hold and cuddle. 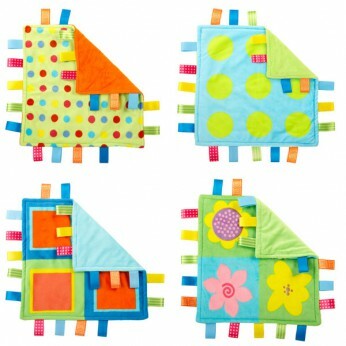 20 bright, engaging and tactile tags around the border offers little ones hours of interactive entertainment and comfort for baby. Classic security item nurtures and provides sensory stimulation and fine motor skill development. Perfect for home and on- the-go. Assorted designs available. 1 per pack.styles may vary Machine washable. Size: 12 inch x .25 inch x 12 inch. This toy costs approximately £7.99 (for the latest and best prices make sure you check our retailer list for the Little Taggies Colours Collection above). In our review of Little Taggies Colours Collection we classed it as being suitable for ages 0 to 11 months but recommend you check the manufacturer specific advice before purchasing.